A Massachusetts dentist plead guilty yesterday of Medicaid fraud and assault and jury tampering. Michael Clair had been banned from providing services to Medicaid patients, yet, but in so many cases these days, that means little. He still managed to collect $130,000 in fraudulent reimbursement. He would have other dentists in the dental practice provide billing services for work he did, in order to service Medicaid patients. He also managed to get his staff to fill prescriptions and give him the pills. Tsk Tsk His dental license had been revoked in Maryland, West Virginia and Florida, but Mass let him in! Yes, those dental boards are fantastic!! NOT! A couple of sad things, one, it took 4 years to get here! There were anonymous reports to the dental board (yes, I'm 100000% positive on that and they weren't so anonymous! ), many other letters of concern and pleas for someone to stop this man. His dental license was suspended in 2006 and he's supposedly barred form practicing dentistry, which means, he's probably already open another office. I saw your post regarding the dentist in Mass that "did a root canal with a paperclip. I am not defending him at all. 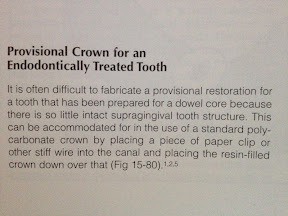 I just wanted to let you know that the use of a paperclip as part of a provisional crown is a legitimate technique. Now, I have no knowledge of the legitimacy of billing this to Medicaid. Attached is a photograph I just took from Herb Schillenberg's "Fundamentals of Fixed Prosthodontics" 3rd edition. This is the most cited text book on the market on the subject of fixed prosthodontics.